Nicknamed the Queen of Latin, Shirley Ballas is one of the top and most decorated professional dancers in the world. Shirley has been dancing since she was 2 yrs. old. She began her dancing career in ballet and tap. While attending her weekly Girl Guide class she noticed a ballroom dance class next door. She was fascinated with the class and started lessons the following Saturday. This was the beginning of her lifelong love affair with Ballroom and Latin Dance. She went to class on Saturdays and competed with another little girl as her partner from age eight to 12. Desiring greater competition, her mother took her to a studio in Liverpool; and at 14, she moved to South Yorkshire, where she had the privilege of dancing with the British Junior Ballroom Champion Nigel Tiffany for two years. Having more of a flair for Latin, she teamed up with Sammy Stopford. They went straight into competing in the Professional Latin field. At age 18, and she won her first major title, The United Kingdom Closed Championship. Sammy and Shirley where the fastest rising couple in the history of Ballroom Dance. One year later she achieved an incredible 3rd place at the Professional World Latin Championships. By the age of 23 she had won all major titles worldwide. In 1983 Shirley met Corky Ballas during a Latin Competition in Quebec, Canada. She was hired to teach Corky in Houston, Texas and later became his partner. Within 8 months they became United States Latin Champions and held this title for 7 years. During this period, she married Corky and the pair welcomed their only child, Mark. They went on to win many prestigious awards making them the most successful Latin American Champions in USA history. They decided to move to the UK to further their career and see how well they could do on the International circuit. It is here that Corky and Shirley Ballas became guardians to the future professional champions of Dancing with the Stars, Derek and Julianne Hough. She is the only person to have ever won the British Open To The World Latin American championships in Blackpool with two different partners and reached the finals an impressive 17 times. Shirley still remains the youngest ever female to reach the British Open To The World dance championship finals. Though she retired from competitive dance in 1996, she continues to share her knowledge of dance. She is regarded as one of the best Latin coaches worldwide and has trained a majority of the Top Latin Professionals and Amateur Dancers in the World of Ballroom and Latin. 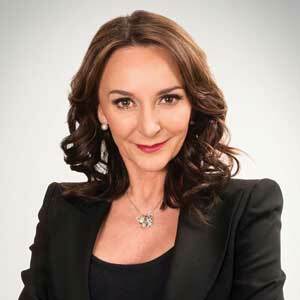 In 2017 Shirley Ballas joined the judging panel of Strictly Come Dancing on BBC One, replacing Len Goodman as head judge.